*A sincere thanks to AP & Sazerac for the sample. The year 1792 was a fairly notable one in French history. France declared war against Austria and the Prussians declared war against France. Claude Joseph Rouget de Lisle wrote La Marseillaise in Strasbourg, while Dr. Joseph-Ignace Guillotin advocated for a more humane form of capital punishment and ended up forever being linked to a rather savage beheading device. The Bastille was stormed and the monarchy, including Louis XVI and his queen, Marie Antoinette, was overthrown (and rather savagely beheaded). The first République Française was established and the revolutionary army kicked some Prussian derrière at the small, but noisy and symbolically important Battle of Valmy. I thought it only fitting to mention France’s trials and tribulations of the year because 1792 was also an important year for the great state of Kentucky who, as we all know, produces a certain kind of whiskey that has a French-origin name. On June 1st, 1792, Kentucky became the 15th state in the newish United States, and over the years has made a name for itself with bourbon, bluegrass, derbies, Sluggers, fried chicken, the Bowling Green Hot Rods, and countless other contributions. Though bourbon may be made anywhere in the United States, Kentucky is currently producing more than 90% of all bourbon made. Indeed, there are more barrels of bourbon maturing in Kentucky than there are people…not people maturing, though that’s happening, too, what I mean is there are simply more barrel heads there than there are human heads…which kind of brings us back to the Guillotin. 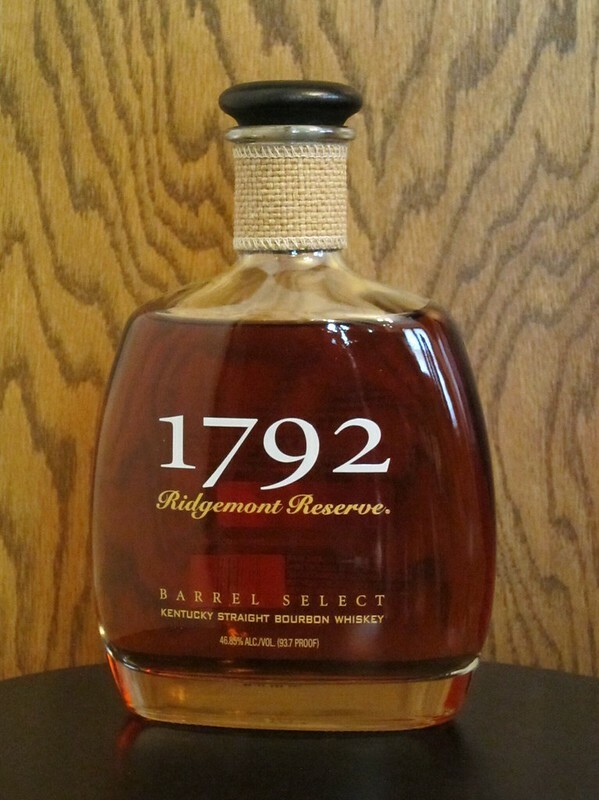 Anyhoo…1792 Ridgemont Reserve Kentucky Straight Bourbon Whiskey commemorates Kentucky’s statehood not just in name, it is also distilled at what is now known as the Barton 1792 Distillery…at least that’s what its parent company, Sazerac, calls the distillery on the 1792 Ridgemont Reserve website. It seems the distillery is just as often known as the Tom Moore distillery. A certain Tom Moore founded it in 1879, and operated it until he sold it to Oscar Getz in 1944. Oscar Getz and his partner Lester Abelson had founded a drinks business in 1933 called Barton Brands and Barton is what the pair renamed their new distillery. Over the next few decades, Barton did well as whisky’s popularity soared, and did poorly as it waned in the late 70’s and early 80’s. In 1993, Barton Brands was sold to the large drinks company Constellation Brands. Just recently, in 2009, Constellation sold the Barton line to Sazerac and Tom Moore became the second of the company’s Kentucky distilleries. Tom Moore/Barton 1792 still produces a great deal of whisky, along with this “super premium” Ridgemont Reserve, there are also a number of fairly high quality “value” brands as well, including Kentucky Gentleman, Kentucky Tavern (presumably someplace frequented by Kentucky gentlemen), Ten High, and Very Old Barton. Sporting a rye-heavy mashbill, aged for eight years in a warehouse that gets a lot of exposure to the elements, and bottled at a higher-than-usual proof, Ridgemont Reserve definitely seems to be the one whisky in the Barton portfolio with an eye towards today’s bourbon connoisseur. The Nose: A rich, slightly voluptuously sweet nose. Up front notes of butterscotch, French vanilla ice cream, juicy tangerines, and bruised apples show off the sweet side. There’s a lot of rye spice and wood influence to balance that sweetness. Nice notes of toasted rye bread and warmed corn bread with roasted walnuts and a bit of nutty chocolate brownie. The wood comes through as bright cinnamon, sweet clove, more vanilla bean along with sawn oak. Subtle notes of wet stone, under-ripe banana, and a faint hint of mint. The Palate: Initially, the mouthfeel is leaner and more aggressive than that sweetly voluptuous nose would lead you to expect. Still, there’s a lot of caramelized sweetness, along with even more spicy, prickly rye that’s apparent right away. A bit of orange rind and baker’s chocolate are quickly washed over with an oak-heavy wave of spice. The wood notes from the nose are even bigger here, tannic clove, coarse vanilla bean, strong cinnamon, and earthy, rough-hewn wood. Lesser notes of popcorn and barrel char are there as well, leading to the finish. The Finish: Tannic with a little burn. Brown sugar, burnt popcorn, lingering rye and a touch of anise. Thoughts: Rich and fairly powerful, this one really grew on me. At first, I wasn’t sure about the disparity between that blooming, rounded nose, and the more attacking, sharp-edged palate. This is very smooth stuff despite its vibrant palate and high-rye profile, it comes across as having a roughly elegant edge, or an elegantly rough edge…I can’t decide which. It’s relatively weighty bourbon, the sweetness and the powerful oak-influenced richness of the palate make it a fine after-dinner/dessert sipper, but with strong rye presence, it works well in a luxurious cocktail (makes a nice Manhattan if you use a more robust vermouth). I see this around for $27-$32, which I think is a pretty good value. Definitely recommended. < Previous Canadian Whisky, The Portable Expert – Book Review. This sounds sublime. And the price is great. American whisky selection is unsurpassed. We’re pretty limited in Canada, especially when it comes to bourbon. Next time I’m in the states I will probably look for this.